The F.N. Historical Society Inc. Important Notes: Please do not email us unsolicited photographs of an item or gun you are trying to identify or date. Unsolicited attachments like photos will be deleted or returned unopened. Due to the increasing number of time consuming inquiries, we can only respond to select emails, time permitting. We do NOT sell parts or firearms, please do not email us your "Want List" or inquiries about parts as this is not our business. We deal strictly in historical information / publications. Thank you for your cooperation! FN Browning Model 1899 vs. FN Browning Model 1900: The Model 1899 was first produced in January 1899 and closely resembles John Browning's prototype. 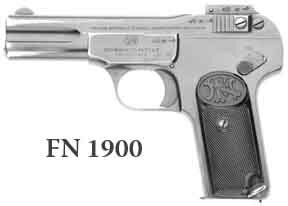 It can be differentiated from the FN Model 1900 by the following features: There are no safety markings and no lanyard ring, the frame has small side-plates. The grips are secured with studs and nuts. The FN Browning 1900 was introduced in 1900 after Belgian military trials requested changes to the Model 1899. The Model 1900 has larger grips which are secured with screws, has French language safety markings (Feu & Sur), a lanyard ring and larger frame side-plates. FN Browning Model 1903: The Model 1903 in 9mm Browning Long was manufactured for the military market. It was not a copy of the Colt 1903 as is often reported. FN requested a (military) handgun design from John Browning in 1901. The same prototypes were presented to Colt and FN, Colt opted to manufacture a pocket pistol while FN tried to fill a void in their line by offering the design as a military pistol. FN Browning Model 1905 / 1906 vs. FN Baby Browning: The Model 1905 is often referred to as the Model 1906, generally in the U.S. it is known for its first patent year "1905" while in Europe, 1906 refers to FN's first manufacturing year. This model is also commonly known as the Vest Pocket model. 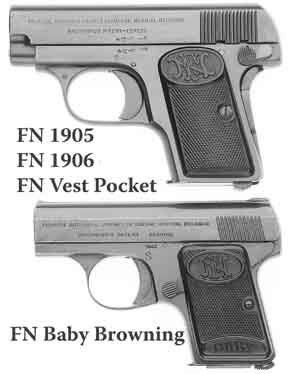 The Baby Browning was introduced by FN in 1931, the pistol is smaller than the Vest Pocket model. The Baby Browning is a total different design from the earlier Vest Pocket pistol, parts are not interchangeable. These are not FN made pistols and do not feature the typical FN quality. The PP pistols were made in one of the former Soviet countries and are available with any marking or manufacturers marking at extra cost. Somebody ordered a batch of these pistols with FN’s older legal name marked on the slide, this was done solely to mislead buyers / collectors into believing that they were getting a genuine FN made gun. FN never produced the PP and these were not made for the Belgian police as often claimed in U.S. advertising. Belgian law-enforcement agencies did not use the PP or PPK. The following misconceptions circulate in the international collector community. Here are some answers and comments that may clarify how the facts were misunderstood. FN was a German company?! FN has always been a Belgian company, from its inception up to the World Wars. It should be noted that the company did endure a German majority take-over from 1896 to 1914. In such, the majority of shares were in hands of a German company. Majority ownership however does not mean that a company changes national identity. During both World Wars the company was sequestered and under German control. FN was established by Loewe in Germany?! The Belgian government (not FN) purchased the production rights for the 1889 Belgian Mauser and ceded those to FN. Loewe had no influence or control in the establishment of FN. FN engineers did purchase equipment and technical assistance from Loewe after the company was in existence. Loewe was selected after FN engineers had explored buying their machinery in the U.S. but ran into problems when U.S. manufacturers did not want to modify and make the machinery on metric specifications. FN was crucial to the German war effort and produced many guns for the German military?! FN was not one of the most useful bodies to the Germans in WWII. Instead it was more a source of aggravation for the Germans, as they could not get production up to desired significant numbers prior to 1943. The Browning 1900 was the first Browning produced pistol?! Because no research was done for decades, the first Browning pistol is often credited to the FN Browning 1900. We know now that the 1900 was a modified 1899 model. 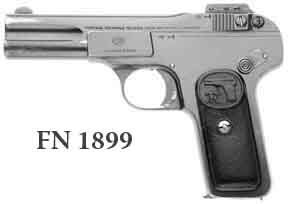 The 1899 was the first of the Browning pistols to go into production at FN in January 1899. The 1900 followed in mid 1900 after the Belgian military requested changes to the original Browning design. There is a clear distinction between the 1899 and 1900 models, their production run and production periods. The Belgian army adopted the FN 1903 and 1922 in the pre-WWII era?! The High Power in 1935. The Belgian government made no equipment updates in the 1920s. The first signs of replacing or adding to the pistol inventory dates from 1930. This was further spurred on (among a general modernization) in 1933 when Hitler gained power. The first broad army evaluations for the 9mm x 19 High Efficiency (not High Power) date from 1933. The confusion with the 1922 comes from the fact that the Belgian military did end up buying the pistol in 1945. This was done because the model was readily available from FN right after the war. The Belgian government bought A-prefix pistols as well as newly produced pistols in those years. It also used wartime-produced pistols that were left by the Germans. Almost immediately there were issues / complaints about the magazine safety being present on some pistols and not on others making it difficult to train military personnel on a new pistol procedure as not all pistols were alike. The FN Browning 1910 was made during WWII and supplied to German officers?! 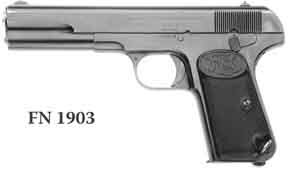 Only two pistol models were produced; the 1922 model as well as the High Power. The first High Power pistols date from before 1935?! A frustration that advanced collectors share is the fact that the High Power and High Efficiency are rarely credited correctly. The forerunner of the High Power was the High-Efficiency, so named by FN in 1929. The High –Efficiency model was catalogued and made available in the 1929-1930 period. I suspect that the High Efficiency was made in very limited numbers just like FN did with the 1903 model before securing a large military contract. Just like distinguishing the 1899 and 1900 models, it is important to call a pistol by its correct designation. All prewar military Mausers were 24/30 models!? The confusion with FN Mauser models originated with the 1930s FN Catalogs, which often showed the 24/30 nomenclature. This was done as customers could select either model, as both models were available in the early 1930s. This nomenclature should never be used today in order to identify rifles as customers did either select a 24 or a 30 model. There is no such model as a 24/30 as there is no hybrid between the two. There are distinct differences between the 1922, 1924, 1930, and 1950 models. FN produced Mauser rifles for the German military during WWII!? Unlike stated in many places, FN never produced any Mauser rifles during the occupation. Only a select few parts were made, most notable barrels and bolts. Those were exported to other plants and FN’s role was only to supplement parts production. FN had a FN 1935 Mauser!? Another great misconception is that many claim that FN had a 1935 Mauser model. FN never adopted this as a factory designation; it was solely the model designation of their customer. As such, the Peruvian rifle is not a FN Model 1935 but rather a Peruvian 1935, the same is valid for the Belgian military 1935 (both rifles are totally different from one another). Both designations are military designations and are not FN designations. FN did indeed print literature and manuals in Spanish for their Peruvian customer. The Peruvian Mauser is referred to as ‘Modelo 1935’, just as it is on the rifle. These designations are references to the Peruvian designation. FN often printed up literature for their customers and included the customer’s requests as happened in this case.